While a golden age for secular arts, Japan’s Edo Period (1603-1867) is broadly dismissed by art historians as a period of stagnation for Buddhist sculpture. Although some scholars have challenged this view, the craftsmen who created religious imagery at that time remain in the shadow of their artistic forbearers. A notable exception to this is the priest-sculptor Enku (1632-1695), whose roughly hewn wooden sculptures are the subject of a new exhibition at the Tokyo National Museum. The exhibition comprises 100 statues from Buddhist and local folk belief, ranging from a few centimeters to over two meters in height. Of these, 61 are from Senkoji Temple in Takayama City, Gifu Prefecture, where Enku stayed during the mid-1680s. 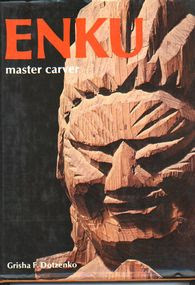 Carving statues from local timber in exchange for food and lodging, Enku traveled throughout eastern and northern Japan, including Hokkaido, climbing sacred mountains and preaching. He allegedly pledged to carve 120,000 Buddhist figures. Today there are about 5,300 works attributed to him, mostly in the Hida region of Gifu Prefecture, and in Aichi Prefecture. According to the 1790 text “Eccentrics of Recent Times,” his statues were thought to possess magical qualities and Enku himself was believed to have the power of prophesy. 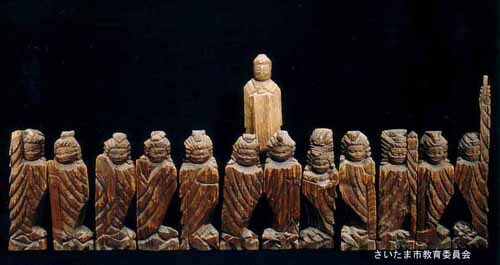 Enku carved each figure from a single block of wood, in contrast to the prevailing method by which multiple blocks were carved separately before being assembled. Religious sculpture was typically finished in bright colors, but Enku’s statues were usually unpainted or given a coat of sombre gray, and no attempt was made to disguise the marks from his tools or knots in the wood. Many are starkly minimalist, with facial features indicated by only a few incisions by his chisel. Little is known about Enku’s life, but it seems that he was largely self-taught; however, his energetic yet sensitive handling of the wood, together with its natural color and texture, gives his creations vitality and warmth. He made his sculptures for farming people, whose very existence was closely tied to seasonal weather and diseases. To secure rain, people would appeal to figures of Buddhist or local extraction, such as the Dragon King or the Senju Kannon, a bodhisattva with a thousand arms and eleven heads. 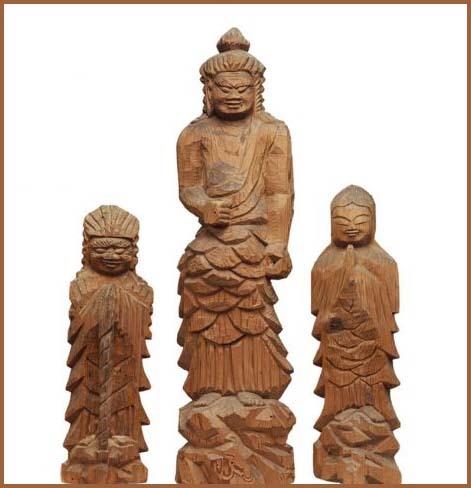 Enku’s Kannon from Seihoji Temple, also in Takayama, has nine heads and 28 arms, but the deity’s principle face is compassionate and lively and was perhaps a source of comfort to the faithful. Another intriguing work is a two-meter-tall statue of Ungyo, one of a pair of the Benevolent Kings, also known as Nio, which are usually found guarding temple gateways. Enku carved this work from a tree as it stood within the grounds of Senkoji Temple, retaining the stumps of branches on its rear surface. “Eccentrics of Recent Times” includes an illustration of Enku carving such a sculpture from a living tree while perched on a ladder. The most visually complex piece exhibited is “Seated Ryomen Sukuna,” created late in Enku’s life. The Sukuna was a two-faced demon who, according to the “Chronicles of Japan” (compiled in 720), ruled the Hida region with an iron fist until it was conquered by Emperor Nintoku (313-399). Hida folklore, however, claims that he defeated an evil dragon and is an incarnation of Kannon with the power to grant salvation. The statue is thought to have been commissioned by the chief priest of Senkoji Temple; the subject may have been chosen to appeal to locals for whom the Sukuna was benevolent rather than despotic. Although roughly chiseled, the expressive facial contours and details, such as fingernails and a dimpled lower lip, illustrate Enku’s command of his craft. Enku equipped the Sukuna with an axe, perhaps in deference to local descriptions, or maybe on an artistic whim. In the years following his death, Enku was remembered more for his religious exploits than as a sculptor. Nonetheless, his deities quietly served rural Japan for generations. Gradually, religious iconography began to acquire value as objects of aesthetic appreciation. In the 1930s, Enku’s fellow sculptor-priest Mokujiki Myoman (1718-1810) was “discovered” by the Folk Crafts Movement, but it was not until the 1960s that collectors and scholars with taste and knowledge informed by Cubism and Expressionism became interested in his work. Enku’s sculptures will appeal to visitors appreciative of the geometric forms and abstractions of modern art; however, the exhibition’s curator Asami Ryusuke urges us to remember the big differences between everyday life today and in Enku’s time.